It is not very often that I rip out pages from cookery magazines for use at a later date, so it was a surprise when the other day I found some pages I had ripped from a copy of the magazine, Delicious, from some years back. In it, I had obviously fallen for some beautiful photography of brightly coloured and divine looking marshmallows. I love marshmallows. They are one of those things that I know I should dislike but really love - another guilty secret is Haribo sweets, which we used to buy as a treat when we went to Munich to visit relatives back in the 1970s, but which are ubiquitous nowadays. 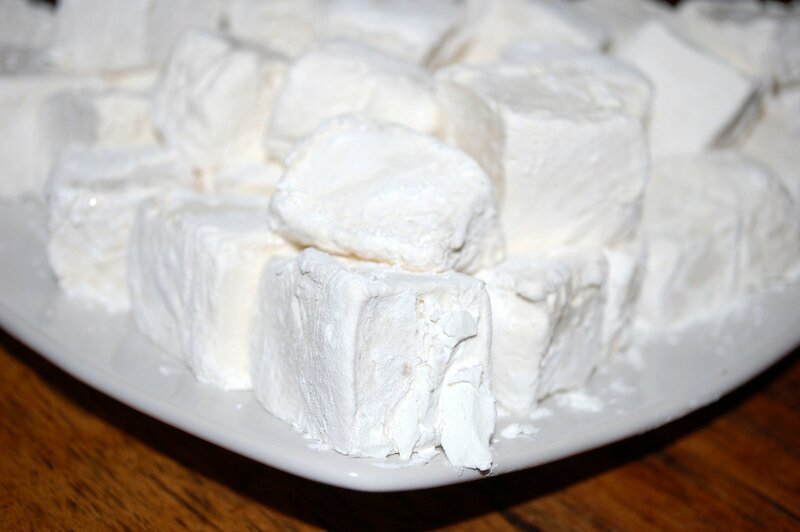 Many years ago I tried to make my own marshmallows but they came out as a truly gloopy mix - a cross between a sweet and jelly cubes. So I liked the idea of creating something really fluffy and delicious. This recipe really does work and the key is getting the fluffy, bubblegum stage in the middle just right. Interestingly, after a week, they had the texture and flavour of shop-bought marshmallows, which just goes to show how different freshly made is from manufactured foods. I reckon that you could make deliciously flavoured versions with orange extract or rose water (or better rose oil), or matcha. The bittersweet of matcha tea against the sugar syrup of the marshmallow would go well, and the colour would be weirdly enticing. Line a baking tray of rough dimensions that's 2cm (½ inch) and 30cm by 20cm (12 inch x 8 inch). You should use clingfilm for this that has been well oiled with the vegetable oil. Pour the cool liquid into a mixing bowl, ideally the bowl for your mixer. You can use this stage to get a good flavour into the marshmallows, for example we used citrus and berry smoothies. You could use matcha tea or spice flavours (see notes later), but if you want to add cocoa powder or coffee or fruit liqueurs or spice extracts, these should be added later. If you are adding flavours later, just use water at this stage. Sprinkle over with the powdered gelatine. Set aside to allow the gelatine to absorb the liquid; it may need a stir to ensure that any dry patches are fully dampened. Put the caster sugar, golden syrup and warm water into a heavy bottomed pan, then over a medium heat dissolve the sugars to create a syrup. At this stage, you should stir it gently to help with the creation of a sugar solution, brushing down any sugar crystals on the edge of the pan as these could burn later. When dissolved, increase the heat and let the sugar syrup start to boil. Let it boil pretty vigorously, but obviously without going over the top of the pan. Do not stir, but check the temperature every so often. When the temperature gets to 130C/266F, take off the heat and let cool for 1 - 2 minutes. Do not let the temperature rise above 140C/284F, nor use below 130C/266F. As it is cooling whisk the gelatine-liquid mix in a food mixer using a balloon whisk attachment. Slowly drizzle the sugar syrup down the side into the mixing bowl; do not pour into the middle directly on to the whisk as this will crystallise out the sugar. 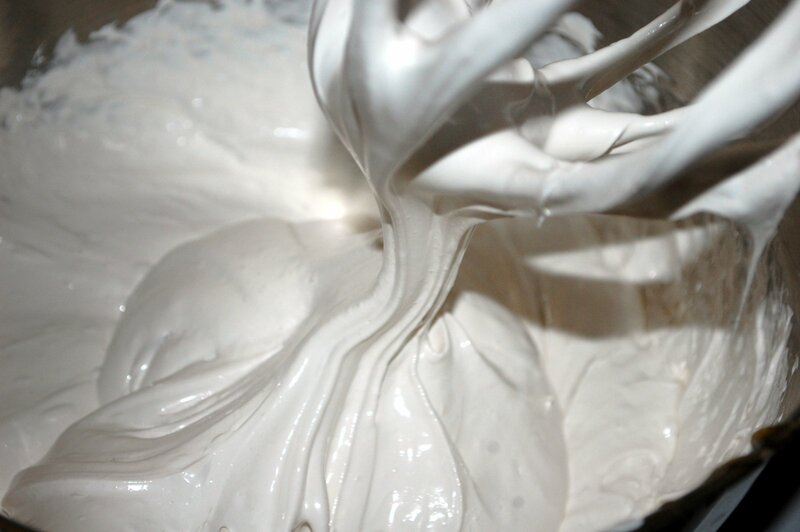 Whisk for some time to allow the mixture to cool down and to expand in size to an opaque bubblegum texture. You can add flavours like coffee, chocolate, cocoa, fruit liqueurs or vanilla extract at this stage, or maybe rose oil or matcha tea. Pour the mixture into the lined baking tray, then smooth over the top with an oiled knife or spatula. Cover and leave to set for at least 2 hours by which time the top will be firm, but very sticky. 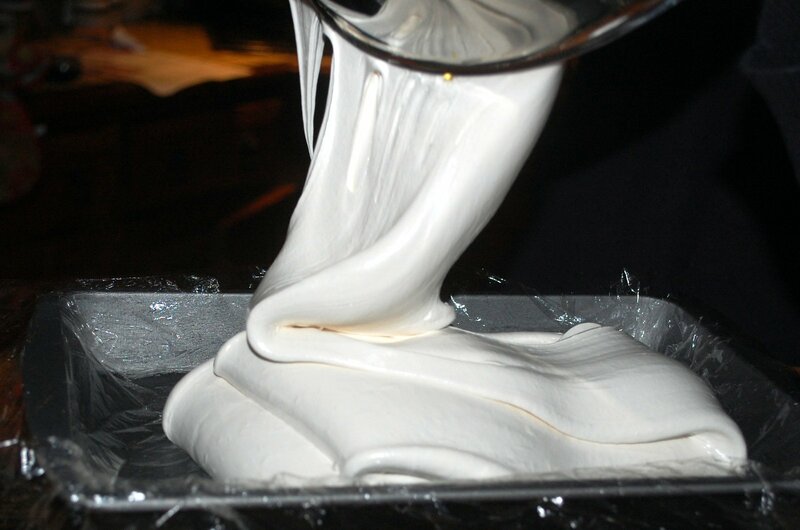 When set, dust a surface with some cornflour and turn the marshmallow on to this surface. Gently remove the clingfilm, which will be pretty tightly stuck with the marshmallow. Then with an oiled sharp knife cut into cubes and then dip into cornflour to counteract the stickiness. Eat and enjoy. As alternatives, you could use an infusion of mug of matcha tea or perhaps 1 cinnamon quill infused in boiling water for 15 minutes, then allowed to cool. It is important to let the liquid for the gelatine be cool, so place in fridge to make sure of this. Then for a colourful outside, you could grind some freeze dried fruits or berries in a coffee grinder, or you could use desiccated coconut.